The Hamer are a tribal people in southwestern Ethiopia. They live in Hamer Bena woreda (or district), a fertile part of the Omo River valley, in the Debub Omo Zone of the Southern Nations, Nationalities, and Peoples Region (SNNPR). They have a population of abaout 46,532 people. They are largely pastoralists, so their culture places a high value on cattle. They have a real tradition of the pastoral culture, cow jumping. This rite of passage for men coming of age must be done before a man is permitted to marry. The man-to-be must “jump the cattle” four times to be successful and only castrated male cattle and cows may be used to jump over. This test is performed while naked (except for a few cords bound across the chest) as a symbol of the childhood he is about to leave behind him. On completion of this test, the young man joins the ranks of the maza – other men who have recently passed the same test and who spend the next few months of their lives supervising these events in villages throughout the Hamar territory. The village’s women (and in particular, the would-be jumper’s sisters) purposefully provoke the maza into lashing their bare backs with sticks which inflict raw, open wounds and scar them for life. Women commonly end up as the heads of families because they marry men who are much older than themselves while they are young. When her husband dies she is left in control of the family’s affairs and livestock. She is also in control of his younger brothers and their livestock if their parents are dead. Widows may not re-marry. 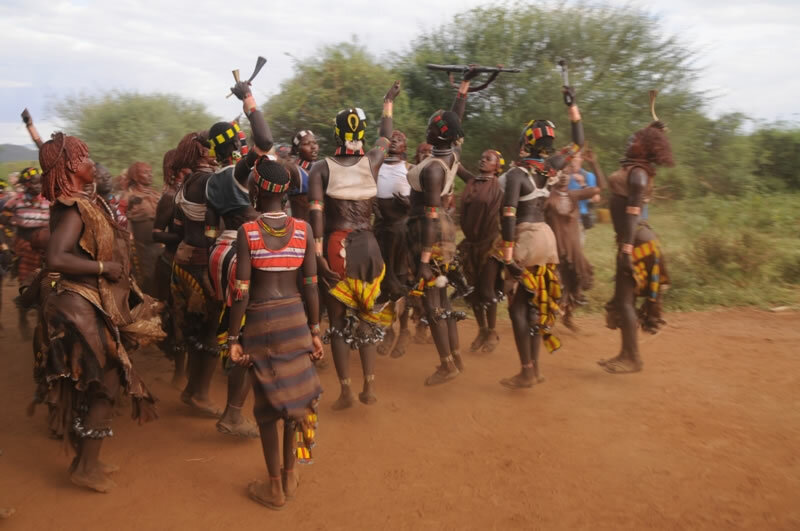 The ceremonies end with several days of feasting, including the typical jumping dances, accompanied by as much sorghum beer as the cow-jumper’s family can provide to the visitor.